Hi there. My name is Emma, and today's video is about the word "about". So before I begin, well it's also -- sorry --, it's about "about", "about to", and "not about to". So we're going to look at what "about" means, what "about to" means, and what "not about to" means; they have different meanings. But before I begin talking about the grammar and what these expressions mean, I just want to say that you'll notice I have a Canadian pronunciation of "about". Okay? So, if you ever hear an American make a joke about a Canadian, one of the jokes they often make is about the way Canadians say "about". For me, I don't actually hear the difference between how Americans say "about" and how Canadians say "about", but any time I go to the States, as soon as I say this word they go, "You're a Canadian." So just so you're aware: I have a Canadian pronunciation of the word "about". So let's get started. 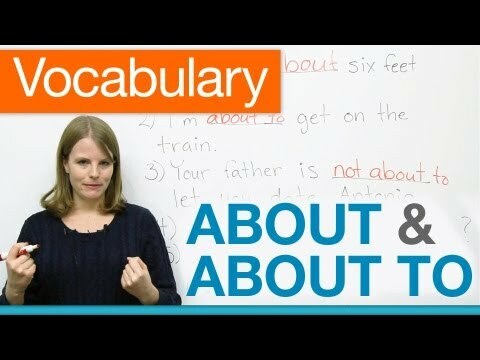 First I'm going to talk about the word "about", then "about to", and then "not about to". Okay, so "about". Now, there are many different meanings of the word "about", I'm just going to go through two of the most common. So these are not all the meanings, there are a lot of meanings. This is just... these are just the two most common. So I have an example sentence here: "It's about five miles to town." So this means it's close to five miles to town; it's around five miles to town. I'm not saying exactly, it's five miles. I don't know, maybe it's 5.2 miles, maybe it's 4.9 miles, but it's around five miles. I could say, "It's about three o'clock." I don't mean it's exactly three o'clock. Maybe it's 2:59, maybe it's3:05; it's close to that time. Okay? So that's the first meaning that we use very often when we want to say: "It's not exactly, but it's close to." The second meaning is when we want to say what the subject is, we want to know what the subject of something is. So you might ask somebody: "What's Titanic about?" So this is: -"What is the subject of the movie?" -"Well, it's about two people who fall in love on a sinking ship." Another example of the same idea with subject -- I love this question --, "What are you thinking about?" So I have a friend who always asks her husband this question. She looks at him and she says, "What are you thinking about?" And he's probably not thinking about anything I'm pretty sure or maybe work, and he always says to her, "Nothing. Nothing, I'm, I don't know. I'm thinking, I don't know, sports?" So my friend always asks this question hoping that he will say something very deep, maybe something romantic, maybe something sweet. But usually, I'm pretty sure he's not really thinking about much. So these are probably the two most common usages of "about". So again, "close to" and you want to know the subject. So now let's look at "about to". Okay, so now I'm about to talk to you about "about to". So "Be + about + to", this has its own unique meaning. So "be" is a verb, then you need "about", and don't forget this little preposition, this is important: "to". What does this mean? It means you're going to do something soon; you're very close to doing something. "I" -- you have your subject -- "am" -- which is the "I" form of "be" --, "I'm about to eat dinner. Can I call you when I finish?" So this means: "I haven't started dinner yet, but I'm going to eat dinner soon. Can I call you when I finish eating dinner?" Okay? So very simple meaning. "The movie is about to begin." So here we have "is" which is the third form of "be", "about", and "to". So we have "Be about to + a verb". "Be about to sleep. ", "I'm about to sleep. ", "I can't do my homework, I'm about to sleep. ", "I'm about to go to class. ", "I don't have time to talk because I'm about to go to class." Meaning: "I'm going to class soon." Okay? So that's "about to". Now, "Be not about to" actually has a different meaning. Okay? So although it's similar, you still have your "to", the only difference is this is in a negative; the meaning is different. "Be about to" has to do with determination. So, what do I mean by this? Well, here is an example: I might say, "I am not about to stop studying English because I failed a class." So this is a strong way to say... We don't write this, this is something we say in speech when we talk. You're showing the person you have determination. In this case: "I'm not about to stop studying English because I failed a class", you're showing you're not going to give up.